Pork Chops with Apples and Onions - Ambassadors of World Food Tourism. 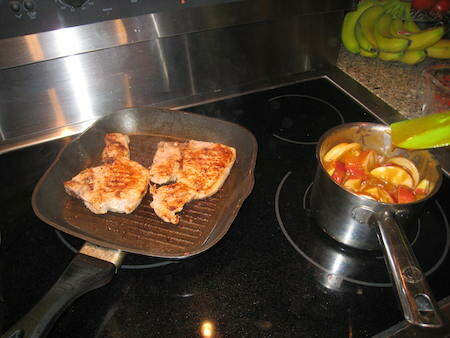 Pork chops and applesauce is a fave on the comfort food circuit. 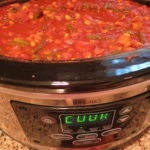 We take this tummy-warmer and give it a little modern twist. 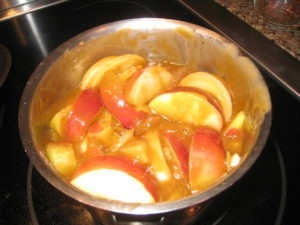 Instead of turning apples into applesauce, we add some sliced onions and make an apple and onion sauce. Saucy aren’t we? 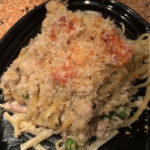 You also don’t need to go outside and hit the grill to make this yummy recipe. 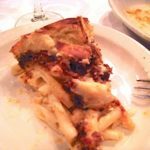 A grill pan, indoor electric grill or even a skillet or broiler will work well too. It’s all about the love, you know. And this dish has loads of it! 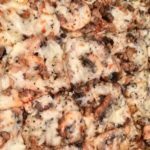 Easy to make, you’ll have them begging for more. This is a recipe for 4 chops, but you can make more or less based on who’s coming for dinner! 2. Sprinkle pork chops with the spices. 3. Grill in grill pan, skillet or broiler (as you prefer) over medium heat for about 3-4 minutes on each side to get the grill marks or brown the outside. 4. 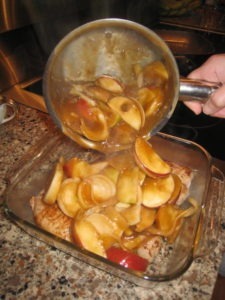 While pork chops are cooking, sauté the onion and apple slices in the butter until they are tender, about 7-8 minutes. 5. Add brown sugar to the apples and onions and cook until the syrup forms and is thick and bubbly. For some added kick, if you like, you can add a splash of apple schnapps or other apple liqueur. 6. 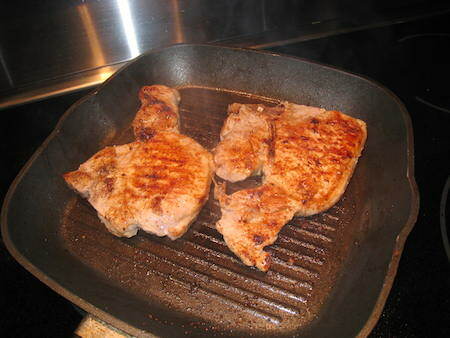 Pour sauce over pork chops and bake in oven about 30 minutes until inserted meat thermometer reads 140 degrees F.
7. Let rest for about 5 minutes before serving. Serve with a fresh green vegetable, like green beans, broccoli, peas, spinach or kale! 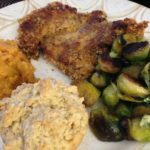 THE QUICK BITE: Liven up your comfort food menu with this tummy-warming, easy recipe for pork chops with sweet and savory apples and onions.